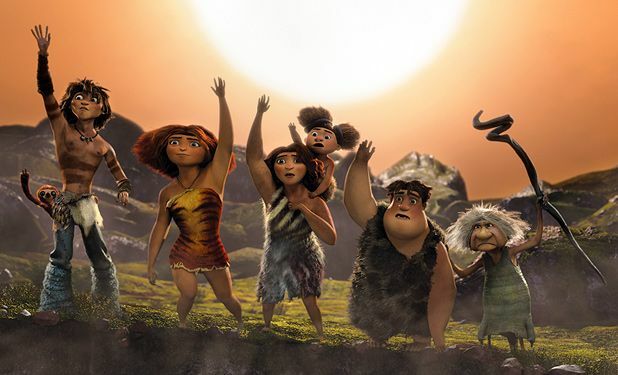 A prehistoric cartoon set around the adventures of a family, The Croods is always going to draw comparisons to The Flintstones, though this DreamWorks-produced 3D title is somewhat different from the Hanna-Barbera classic. Here, there are no stone-age gadgets or gizmos. Rather, The Croods are a frightened family of six that live in a forbidding but fantastical landscape where danger lurks at every turn. If the stereoscopic images are breathtaking, the story is pancake-flat, relying on stereotypical characters to form this blueprint for the nuclear family. Father Grug (voiced by Nicolas Cage) is over-protective; mother Ugga (Catherine Keener) is long-suffering; teenager Eep (Emma Stone) rebellious, her brother Thunk (Clark Duke) a proper Neanderthal. There’s even a sharp-tongued mother-in-law (Cloris Leachman) and a Bamm-Bamm-like toddler. Curiously, the film started out under the title Crood Awakening – with co-director Kirk DeMicco and ex-Monty Python star John Cleese set to write the script for Wallace & Gromit creators Aardman Animation. One wonders how different that would have been, though with DeMicco now collaborating with co-writer/director Chris Sanders, who helped bring that anarchic Disney effort Lilo and Stitch to the screen, it’s clear to see where The Croods gets its more bizarre elements from. Eschewing Jurassic Park-like dinosaurs, the landscape is littered with curious hybrid creatures (a multi-coloured sabre-toothed tiger, for example) that will fire your imagination – more so than the story. It is pure soap, as boy-curious Eep is drawn to orphaned loner Guy (Ryan Reynolds), a more sophisticated cave-dweller to whom Grug takes an instant disliking. Ploughing this coming-of-age furrow is fine, though The Croods hardly does it with any sophistication, preferring to wow us with hyperkinetic action. But there are some nice moments amid the relentless swooping and whooping – not least when Guy invents shoes for Eep and she squeals with delight. Some things never change. Passing from Aardman to DreamWorks, this animation follows a caveman's position as leader of his tribe, and how it's threatened by a prehistoric genius who keeps inventing things like fire.